Nepal, a beautiful mountainous country in South Asia, accommodates about one-third of entire length of the Himalaya and eight of ten highest peaks in the world. Nepal is ranked among the richest country in terms of water resource availability. Physiography of Nepal is unique due to the extreme contrast in topography ranging from 64 to 8848 masl within a very short span of 150 km from Terai Plain in the south to higher Himalayan mountains to the north. Groundwater is available in most parts of the country, but the amount and depth vary from place to place. In the Terai, the upper unconfined aquifer (50–60 m) has been considered as good productive shallow zones and most of groundwater production is limited to upper 250 m. Recharge in the Terai is estimated to be 8800 MCM/year. At present, only about 22% of the available dynamic groundwater recharge in Terai is being utilized. The quality of groundwater is generally suitable for irrigation as well as drinking purpose. 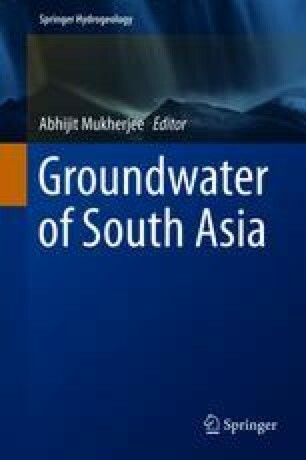 The groundwater in Kathmandu Valley is overexploited. The natural recharge of groundwater in the valley is estimated at about 5.5 MCM/year. The draft exceeds this recharge due to which water level in the valley in some places is going down by 2 m/year. Groundwater from both deep and shallow aquifers is suitable for irrigation without any treatment, but for drinking and industrial uses, treatment is necessary.